On Friday 3rd May 2013 Slinky celebrated its 16th Birthday at its home in Bournemouth. To celebrate this milestone event, residents Lee Haslam and Dav Gomrass recorded their closing set to a packed house. The live recording (set up to include the crowd) captures everything that Slinky is about, great music, a great crowd and great DJ's all coming together as they have done religiously for 16 years to create a unique clubbing experience. What gives this recording added significance is the fact that in all that time this is the first live recording to be made commercially available from the club. Add to that the sad announcement that the next show will be the last with Slinky closing its doors for the final time, then this recording is quite literally the first and the last that will ever take place. Residents Lee and Dav have done the night proud delivering a fantastic set to a typically passionate and excited crowd. The tune selection is second to none and the energy of the night is felt from the first to the last beat. This album will mean different things to different people. A siginificant proportion of the clubbing community have grown up with Slinky and it will be sadly missed. Ultimately, the album stands for quality music and a great night out. Anybody that has ever experienced the unique Slinky vibe will love it and even if you never went, this is trance at its very best. The only thing we would say to anyone that missed the night - enjoy the album, but you did miss one helluva good night out! Take a bow please Slinky! 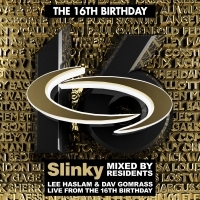 'Slinky's 16th Birthday' is available now from Beatport and iTunes.